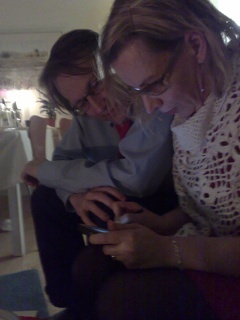 This is a guest blog by Outi and Jyrki Wahlstedt. I loaned my N800 to them in late December and here they write about their experiences with the device. Our Internet tablet is present almost imperceptibly in our life from dawn till dusk. It wakes us up in the morning, and tells news in the evening. It is small and stylish, and it mixes well with the environment. Its utilities include e.g. 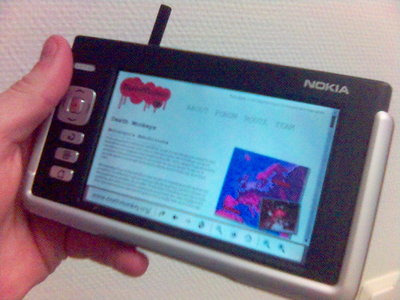 a browser for surfing the net, Skype for phone calls, and several radios. Its smallness allows it to be enjoyed together, not separately as often happens with our personal computers. Several times a day we look at weather information, and TV programme guides. Also we use it in looking for dogs in need of home, this being the most important project at the moment. Though its screen is small, the tablet can be used professionally e.g. to monitor large systems with nagios, as the problem components are discernible due to alert colors. This can be handy for remote control. Skype phone is very easy to use, and we can use it as a speakerphone or with Bluetooth headset. Speakerphone is quite pleasant, as there is no audio feedback from speakers to microphone. Screen quality is good, which enables showing photos as slideshow. 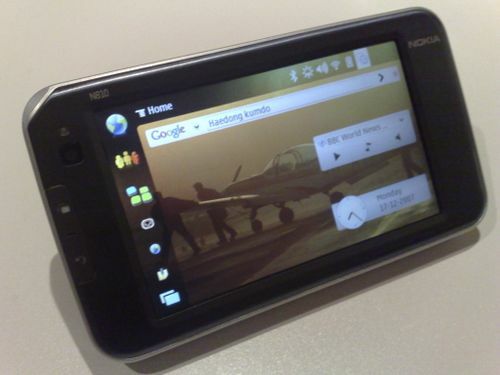 The tablet is easy to use, though there are some difficulties that might be improved in its successor, N810. Screen lock is not very intuitive, the procedure is implemented like in cellphones. In using the screen keyboard it is extremely easy to press <ENTER> and so it is easy to write e.g. an erroneous URL.